Agriturismo Le Mura: Country estate producing pure olive oil and DOCG Chianti wine. It is possible to take part in the grape harvest at the end of September and the olive harvest in November. The enclosed grounds of vines and olive groves are 8 ha in size, situated in typical Tuscan countryside. In the centre of the Florence/Siena/Arezzo triangle, in the best starting location for cultural trips which, on request, can be organized by the owner along with transport and excursions (extra). Every service available in Bucine. Spaccio Prada, 3 km. 4 mountain bikes available to guests. Large working farm "Le Mura", renovated, surrounded by trees and fields. 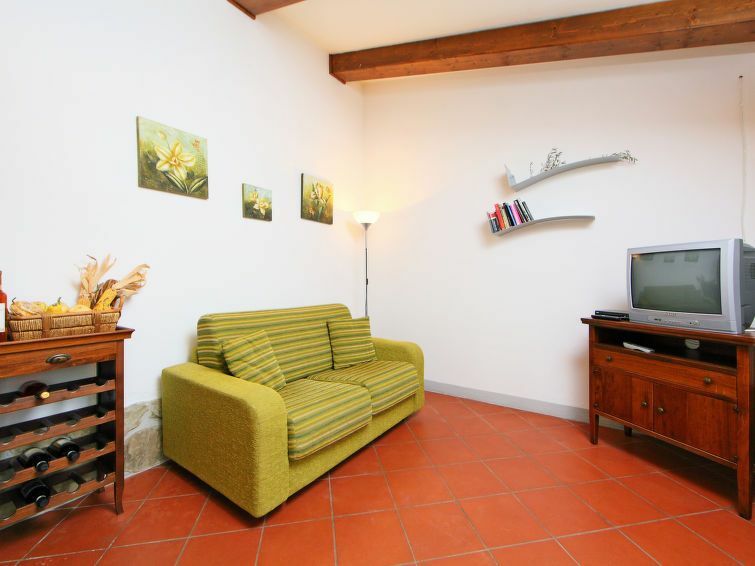 3 km from the centre of Bucine, 25 km from the centre of Arezzo, 35 km from the centre of Siena, in a quiet position on top of a hill, in the countryside. For shared use: swimming pool (7 x 14 m, depth 160 - 160 cm, 01.05.-30.09.) with internal staircase. Outdoor shower. In the complex: WiFi, sun terrace, central heating system, washing machine (for shared use, extra), heating to be paid on the spot (01.11.-15.04. ), heating available only from 01.11. to 15.04.. Linen change (suppl. charge extra). Room cleaning on request (extra). House maid on request (extra). Motor access to the house. Parking at the house. Grocery 3 km, supermarket 3 km, restaurant 3 km, railway station "Bucine", thermal baths 20 km. Nearby attractions: Firenze 55 km, Siena 35 km, Arezzo 30 km. "Simone", 2-room apartment 35 m2, on the ground floor, fully renovated, practical and cosy furnishings: living/dining room with satellite TV. Exit to the garden. 1 double bedroom with shower/bidet/WC. Kitchenette (4 hot plates, oven, freezer). Shower/bidet/WC. Small garden. Terrace furniture. Please note: maximum 1 small pet/ dog allowed. There are 3 steps from the living room to the kitchenette and also from the bedroom to the bathroom.